Are you getting this error on all services you create using the management pack template? I was creating overrides for each one until I found a better way. What you need to do is disable it globally so that all services created with the Management Pack Templates will have it disabled. All you need to to need to do is go into the Authoring console, Monitors and Target Windows Service. Drill down to Overall Service Performance Health. Create an Override For all Objects of type: Windows Service and set the Enabled to False. 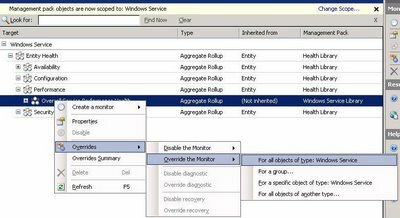 Now all Windows Services objects have it disabled globally… It works because all NT service monitors are inherited from this type.